I walk up to the counter at Starbucks and order my usual white chocolate mocha. I’m in mid-training season for a combine and I start to think about how many calories I just ordered. Is the preferred taste worth it? I make this purchase all the time, how is this affecting me overall? Usually the decisions I make are somewhat calculated and considered but sometimes when I’m not particularly focused, I let what I feel at the moment dictate what decisions I make instead of thinking about how it affects me over the long term. How many times have you made an everyday decision on what to eat, buy, or do without thinking twice about how it affects you? This gave me the idea for an application that helps humans consider the longer term impact by comparing multiple choices & those outcomes. I ultimately decided to call it Collisio. My hope with this project and application is that it helps myself become better at communicating product decisions and honing my process by shining a light into how I do things now. I hope that people, both rookies and pros, will be able to learn something from the whole process and each phase. My goal for the app is to help myself and others become more mindful and aware of the daily habits and marginal gains that we can make to impact and influence successful outcomes in all areas of life. All three of these could be present in the same comparison to show you how one decision affects all three facets. I’ll take the Starbucks example I mentioned above and describe the thought process a little more with this theory applied. We’ll use two factors, Cost & Calories to evaluate the choice. 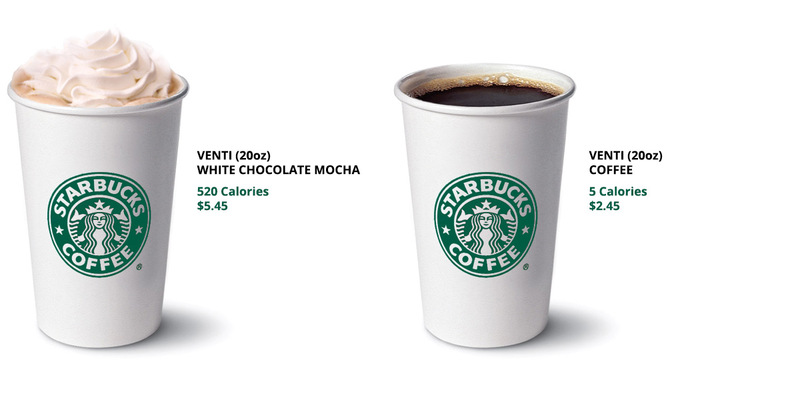 The difference between these two: $3.00 & 515 Calories per event. 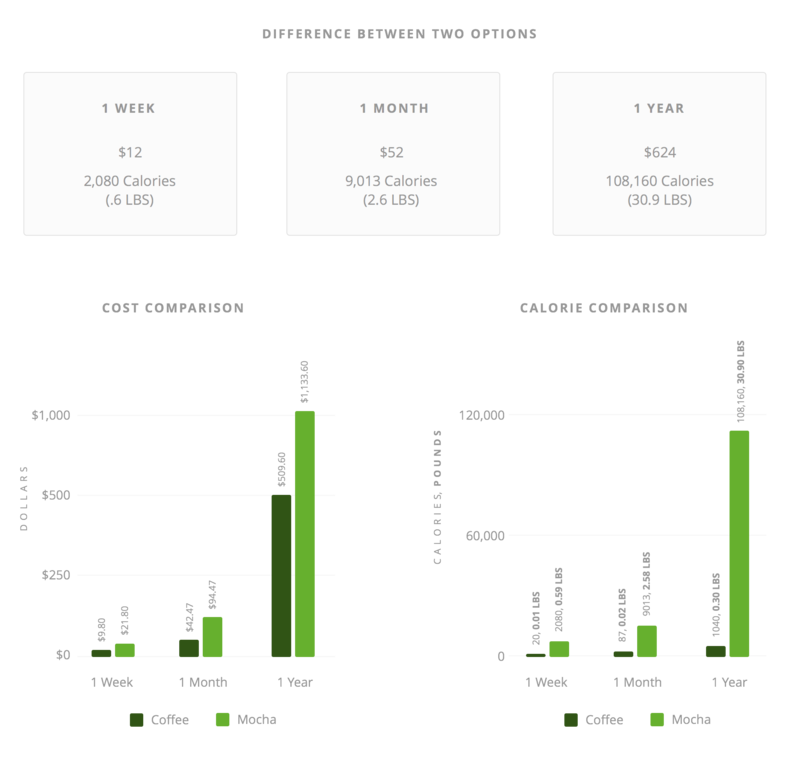 Now, with those data points in mind, let’s say I get coffee 4x a week and equate the calorie difference into potential pounds gained (~3500 cal/pound) from purely a numbers standpoint without considering the other factors that affect this such as metabolism, lifestyle, activity, time of day, etc. The differences in the two decisions over a week, a month, and a year are on top. The difference would be either an increase or decrease based on which switch you made (going from mochas to coffee or coffee to mochas). The data above is really eye opening. This is just a morning coffee routine. Imagine the margins you could make on better decisions throughout other aspects of life. There are tons of other use cases that I perform calculations on all the time that I think would be really useful – like sleeping, time spent, workout habits (burning calories), etc. Using technology to tie into GPS / Location based systems like Foursquare, Yelp, Facebook and Swarm, would help give situational awareness to the app which could nudge you to remember what your goals are and what the impact is right now and into the near future. After recently finishing Hook by Nir Eyal & Ryan Hoover, it’s created a more thorough awareness of how designers and developers can build products to manipulate user behavior. My interest is to create products that manipulate user behavior that benefits them and adds value to their life. Raising awareness and creating new habits will help create new perspectives, which in turn will result in different (hopefully better) decisions and influence outcomes. I plan to dive deeper into the Hook model in the design phase and talk about how we can bring the user through the cycle to create habits of awareness. Interested? I’d Love Your Feedback! I’ve put together a quick 2-minute survey here (http://cl.ly/ZzDI) to gather some feedback on how people view their awareness and conscientiousness towards decision making. If you’d be willing to give me your perspective, I’d be forever grateful! If you’re intrigued by the idea, think it’d be useful, hate it, or have any type of opinion about it – please reach out on Twitter or shoot me an email! I’d love to hear your thoughts. Also, if there’s anything specific along the journey that you’d like me to dive deeper into, just ask! My hope with this project and application is that it helps myself and others become more mindful and aware of the daily habits and marginal gains that we can make to impact and influence successful outcomes in all areas of life. I’ll be documenting my thoughts and process throughout the project. As posts are completed, the titles below will be linked across all relevant posts. I'll be using the list below as a base guide but the final titles & focuses in each section may change slightly over time as the idea and implementation matures.